The stamped inscriptions on this ivory dial are filled with red, green, black and gold colours. It is decorated all over with flowers, leaves and scrolls, inhabited by animals. The corners of the outer surfaces of the upper and lower dials are decorated with gilt brass cherub spandrels (one of which is missing). Two brass clasps allow the dial to be closed, one clasp attached to the opposite side would hold the dial in position while being used. The outer surface of the upper dial contains a windrose with a double sides brass index. The Italian names of eight winds and the cardinal directions in Latin are given, 16 directions are marked in German, partially abbreviated. A hole in the northern section allows the compass needle on the lower leaf to be seen. The inner surface of the upper leaf contains two pin gnomon dials, the one to the left with the zodiacal signs and corresponding lenghts of the days in hours numbered 8 to 16. The dial on the right gives the unequal hours ('PLANETENSTVNDT'), numbered 1 to 12. Between these two dials are points for the attachment of a now missing string for latitudes 39?, 42?, 45?, 48?, 51?, 54?, 57?. Below is a latitude list of 99 European cities in three columns. The inner surface of the lower leaf contains a horizontal string gnomon dial with the hours numbered 4 to 12 to 8 in several circles for the latitudes 39?, 42?, 45?, 48?, 51?, 54?, 57?, 60?. An empty compass well in the centre is marked with a deviation of circa 7? E and the cardinal points in abbreviated Latin; the maker's mark, a crown, is stamped. The instrument is signed 'PAVLVS REINMAN' and dated '1607' between the beginning at the midnight point of the dial with the maker's mark. In the left and right bottom corner are scaphe pin gnomon dials, both decorated with the sun's face. 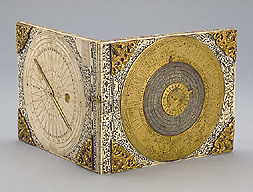 The dial on the left shows Babylonian hours, the dial on the right Italian hours. The outer surface of the lower leaf contains a very elaborate set of alternating gilt and silvered brass discs, with the two in the centre being movable. The outer one contains a calendar with the names of the months in Latin and every single day numbered and the corresponding dayletter indicated. The names of 81 Christian saints and feast days are marked. 1) A 24 hour scale numbered twice anticlockwise 1 to 12. 2) The age of the moon 1 to 29 with the corresponding scales. 3) and 4) A time correction in hours and minutes between solar and lunar time; and 5) the 'EPACTA GREGORII ANNO 1607'. The central disc with an index also has a 24 hour scale numbered twice anticlockwise 1 to 12. The instrument was bequeathed by Octavius Morgan in 1888 and is described in F. A. B. Ward, A catalogue of European Scientific Instruments in the Department of Medieval and Later Antiquities of the British Museum (London, 1981), pp. 36-7, no. 81.